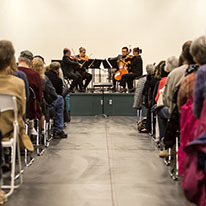 The Symphony builds lasting relationships with communities throughout the Puget Sound region through community concerts, Side-by-Side Concerts and the Community Connections Program for nonprofit organizations. 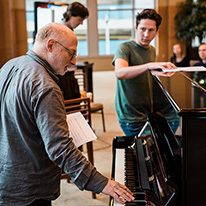 Join us for the culminating concert of the 2019 Young Composers Workshop led by Composer in Residence Derek Bermel. Seattle Symphony musicians will perform 12 world premieres of chamber works written by the composers in this year’s workshop. 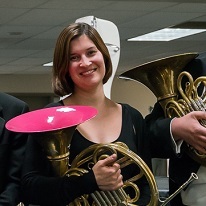 Don't miss these new and innovative works by local young composers! Experience the world premiere of a new work composed by veterans at Compass Housing Alliance in collaboration with composer-in-residence Derek Bermel. This program, curated by veterans, will celebrate those that have served and currently serving in the military and shed some light into their experiences in the service and their return to civilian life. Admission is free, RSVP encouraged. Join us for a joyful celebration of lullabies this Mother’s Day! This moving event will feature songs created by parents at Mary’s Place and performed by Seattle Symphony musicians. Now in its sixth season, the Lullaby Project is a featured program of our Simple Gifts initiative. Admission is free with ticket. The Lullaby Project is a national program of Carnegie Hall’s Weill Music Institute.